The #SciBlogReaders survey is still underway! If you enjoy this blog or another science blog, click here to learn how you can help bloggers and win some cool prizes for yourself. Inside an underground tunnel about thirty miles south of San Francisco, electrons scream by at nearly the speed of light. Suddenly, they find themselves jerked back and forth along their mile-long path by magnets. As they veer around turns, they spit out high-energy X-rays that are the light source for one of the most advanced lasers humans have ever built. Just another day at the lab. The Stanford Linear Accelerator Center, or SLAC, is a nationally funded laboratory dedicated to helping scientists answer fundamentally difficult questions about the matter our universe is made of. At SLAC, the Linac Coherent Light Source (LCLS) is home to one of the world's most advanced X-ray lasers - a billion-dollar device about a kilometer long. What is it like to use an instrument that pushes the boundaries of human technology? A group of University of Michigan researchers found that out for themselves this past October. The proposal that took the group to SLAC was headed up by Roseanne Sension, in collaboration with Jim Penner-Hahn and Kevin Kubarych, all professors at the University of Michigan, and with University of Louisville professor Pawel Kozlowski. Nick Miller and Ted Wiley, graduate students in the Sension group, and Laura Kiefer, a student of Kubarych's, traveled out to California to conduct the experiments with their advisors. Also accompanying the group was Aniruddha Deb, a staff scientist in the Penner-Hahn group. While that might seem like a large group for a science experiment, the shared pool of expertise was instrumental for the group's success. "Each member of the team had something to contribute that the other members didn't know that much about, so it strengthened the proposal," said Wiley. These experiments will make up a large part of his and Miller's theses. The application process is very competitive. The group found out in June that the proposal, titled "Investigating Structural Changes in Short-lived Excited States of Vitamin B12," had been accepted and that they would be making the trip. During the time between that and their October 14 start date, they planned for lodging, and also went through several online training modules not unlike what would be required of new employees at any lab. "It's a government lab, so it's under a lot of scrutiny," said Wiley. "So, you know, you have to be able to use a stepladder correctly." There were a few more training modules on-site at SLAC-LCLS. Then, the marathon began. The group performed measurements between 9 PM and 9 AM for four straight days. "You get delirious on the night shift," said Kiefer. But no time could be wasted. Although the expenses for the actual measurements are paid by grants from the United States Department of Energy, the bill is extremely high - to the tune of tens of thousands of dollars per hour. "So we got to this point where we were just goofing off, talking, and it was like, 'It's eleven dollars a second for you to say that!'" Wiley recalled of the late night experiments. The technique the group used is called X-ray pump-probe spectroscopy. The measurement involves "pumping" the sample with a green laser, putting it into an electronic excited state. Then, a pulse of X-ray light, the "probe," comes in, allowing the experimenter to measure the X-ray absorption spectrum of an electronically excited molecule. "These experiments weren't possible a few years ago," notes Wiley. SLAC-LCLS technicians had built the experiment preceding the group's arrival based on the specifications of their proposal. Once they arrived, all the group had to do to begin measurements was prepare a sample at a nearby laboratory. That's probably for the best, though, notes Wiley. "It's one of the only two free electron lasers on Earth. They're not going to just let some turkey that doesn't know what they're doing do anything for them." Even though the experiment was pre-built, the first day still involved a lot of setup in which the group worked closely with technicians. "During the first day, they have to get both the optical beam and the X-ray beam overlapped in space and time," Miller said. The sample, a jet of solution which shoots downwards through the crossed laser beams, has to be positioned very accurately as well; an error of even 10 micrometers, less than the width of a human hair, is enough to ruin the measurement. After the first day of setup, the group became much more independent. From 9 to 9 solid, the entire group, professors included, was buzzing in the control room. Miller credits the group's diverse expertise for their success. "[...] It made us a lot stronger while we were there," he said. Some people worked on conducting the measurements, while others, particularly Kubarych and Deb, built computer programs to analyze the data on-the-fly. Without the ability to quickly analyze data, "we would have been lost," said Miller. At that point, the technicians let the researchers do their thing. "It's actually amazing how much freedom you have. Once things are going, you can do it," said Kiefer. "It was an exhausting experience," said Wiley. "First of all, you're jet-lagged by three hours by flying to California. Then you invert your sleep schedule and try to sleep during the day." Never mind the four consecutive twelve-hour work days. Despite the endurance contest, Miller, Kiefer, and Wiley seem to think that their efforts were a success. The proposal contained a strong plan with all sorts of contingencies laid out in case things went wrong or data didn't come out as anticipated. "I think the thing that we didn't think about was, well, what do we do if it goes really well?" said Wiley. "And it did go well," added Miller. "We ended up doing some unexpected experiments on the third and fourth day, and those actually are going to be maybe some of the most significant results that we found." As if performing cutting-edge science wasn't enough, the three were exposed to some of the most advanced devices on Earth just by walking through the LCLS facility. "Seeing the technology that they have is un-freaking-believable," said Kiefer. Wiley added, "They had the world's [smoothest] surface for x-ray lasers. The [smoothest] surface on Earth, ever made, being kept in a vacuum that's a thousand times lower pressure than outer space." X-ray pump-probe is just one of the types of measurements that can be conducted at SLAC-LCLS. Overall, there are six different types of experiments available, and a seventh to be added in 2016. With evocative names like Macromolecular Femtosecond Crystallography and Matter in Extreme Conditions, these experiments sit on the fringe of what is possible in experimental science. When asked about his favorite part of the experience, Wiley got poetic. "Messing around with all the gizmos, man," he said. "My favorite part was being at the helm," Miller said, "being in control of the two million-dollar experiment." Kiefer added, "It's pretty amazing that you can be hands-on at this facility." The group wasn't ready to talk about the scientific results yet, but you'll probably be hearing about them soon. SLAC reported last year that 341 scientific publications have come out of LCLS in the five years between 2009 and 2014. Of those, 31% were published in high-profile journals - not surprising, considering that the measurements available there can only be performed in a few other places on the planet. Now that the data has been collected and they've settled back in Ann Arbor, Miller, Wiley, and Kiefer talk about their trip with obvious enthusiasm. (Kiefer's library of photos is testament to that as well.) "It's big science," Wiley said. "In every sense of the word." In this episode of the Chemistry Literature Feature, we celebrate chemistry at the University of Michigan! Keep scrolling to learn about chemical reactions happening high in the clouds, how to teach a bad catalyst to keep itself together for longer, and new developments in small molecule cancer treatments. But first, check out the Chem Lit Feature's newest addition: CLFPic! This volume's CLFPic comes to us from Aaron Goodman, who graduated from the University of Michigan with a B.S. in chemistry and went on to graduate school at MIT. 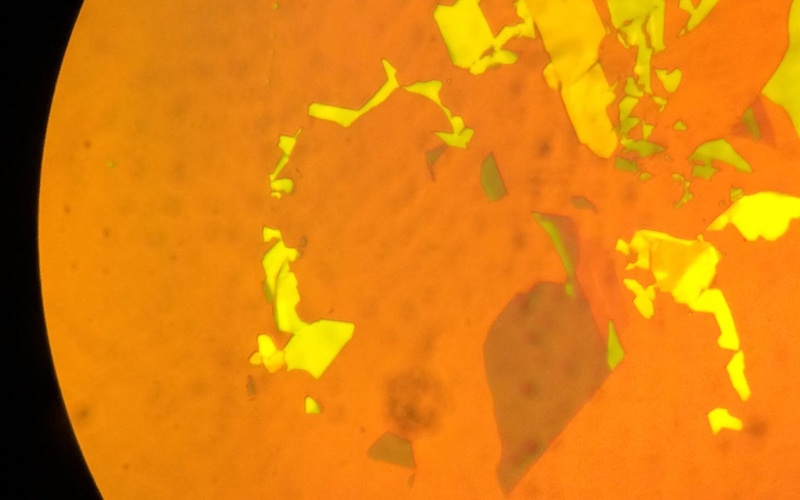 His photo, taken through a microscope eyepiece, shows flakes of molybdenum disulfide, MoS2. MoS2 can be separated into sheets that are only a few atomic layers thick, much in the same way that graphite can be made into graphene. The blue flake in the picture is only 3 atomic layers! Such thin MoS2, which is a semiconducting material, could find applications in miniaturized electronics or light-emitting diodes. Scientists Surveying Science Blog Readers - For Science! Do you have a few minutes for some questions? Dr. Paige Jarreau and Dr. Lance Porter of Louisiana State University want to know who reads science blogs and why - and for that, they need your help. Tree Town Chemistry has been randomly selected to participate in the #SciBlogReaders survey. If you've enjoyed this blog (or if you read it anyway through some sort of self-inflicted punishment), please take a few minutes to go through this survey. You'll be helping the research team and blog writers everywhere to understand who our audience is so that we can create even better content for you. For completing the survey, you'll be entered into a drawing to receive one of two $50.00 Amazon Gift Cards. Two Tree Town Chemistry readers are guaranteed to win, so based on our readership your odds are pretty high (cough). There are other cool prizes that are being given out randomly as well, including some science t-shirts and artwork. Everyone who fills out the survey gets a free science art prize from Paige. Please take 10-15 minutes to complete the #SciBlogReaders survey! Thank you! My dream job is to work for NASA as a research scientist. In fact, I (kind of) lived this dream the summer before my senior year of college, where I was an intern at NASA Glenn Research Center (GRC) in Cleveland, Ohio in the photovoltaics lab. Of all the things I learned while I was there, one that stuck out, albeit trivial, was that they absolutely love making acronyms. In fact, I listened to one presentation where there were more acronyms on the slides than actual words or pictures. Point being, get ready for the most acronym-filled blog post of Tree Town Chemistry’s existence. NASA released in a press conference on Monday, September 28th, 2015 that flowing liquid salt water has been discovered on the surface of Mars. This discovery explains the observation of large, seasonal flows that appear as lines on the slopes of many Martian craters, called Recurring Slope Lineae (RSL), which can be up to hundreds of meters long and up to ~5 meters wide. The discovery of these RSL - and the chemistry behind them - has prompted NASA to further detail some exciting plans of sending astronauts to Mars. What do stained glass windows, single molecule sensing, and light-emitting diodes have in common? Right now, not much. But research from the laboratories of Northwestern University chemists Dr. George Schatz and Dr. Chad Mirkin are trying to change that. Together, they have published several papers on a new breed of nanoparticle superlattices - materials that are turning out to do unique tricks with light. Their research contributes to the field of plasmonics, which encompasses optical phenomena that give stained glass windows their color and could find application in futuristic devices. I have synthesized over 2,500 compounds! I have never been taught what makes a chemical toxic! I have no idea what makes a chemical an environmental hazard! I have synthesized over 2,500 compounds! I have no idea what makes a chemical toxic! Elizabeth Grossman, the author of Chasing Molecules: Poisonous Products, Human Health, and the Promise of Green Chemistry (Island Press, 2011), quotes the above from Dr. John Warner, who is the co-founder of the Warner Babcock Institute for Green Chemistry. Newly released image of Pluto from the New Horizons probe. Unless you (and your Facebook news feed) have been living under a rock, you know about the New Horizons mission to explore Pluto, a mission 9 years in the making. The new high-resolution images have shown us both that Pluto loves us (i.e. the heart-shaped region in the southern hemisphere), and it is blushing from all the attention (its red-orange surface). While astronomers have known the color of Pluto’s surface for years, the high-resolution images clearly outline the terrain on the dwarf planet. But why is Pluto red? The reason may not be the same as you think – and by that, I mean it’s not for the same reason why Mars is red. It’s actually because of some cool chemical reactions between methane & nitrogen with the help of some ultraviolet light and other cosmic rays to produce tholins, long-thought to be crucial to the existence of a “primordial soup”.